The Black Friday results are rolling in, and so far it seems like business as it has been it retail: consumers capitalized on the best deals, Millennials spent the most money and department stores underperformed. Though some stats had pointed to a dampened Black Friday, consensus among analysts now seems to show that the holiday shopping weekend packed a positive punch for retail. According to the National Retail Federation’s report out Tuesday, more than 174 million Americans shopped either in stores or online over the holiday weekend, up from 164 million last year. That’s 96 percent of weekend shoppers who purchased something over the five day spree, and they spent an average of $335. Millennials (25 to 34 years old) spent the most, at $419.52. Black Friday was the most popular shopping day for in-store spending (77 million consumers shopped that day), with Small Business Saturday coming in second (55 million consumers). For online buys, Cyber Monday was the biggest draw (81 million consumers), followed by Black Friday (66 million). Sixty-four million shoppers said they shopped both online and in-store, 51 million went the physical route, and 58 million were loyal to online only. According to NRF, the multichannel shopper spent an average of $82 more than the online only shopper, and $49 more than those who only bought in stores. Lending proof to the premise that Thanksgiving Day shopping may not become as much of a draw as retailers who opted to open had hoped, NRF said 11 percent of consumers started spending before 5:00 p.m. on Turkey Day and another 11 percent after 6:00 p.m., compared to 25 percent who started shopping at 10:00 a.m. or later on Black Friday and 49 percent of consumers who started shopping early Cyber Monday morning. Digital appears to have been the biggest winner in the spending frenzy. In its own report out Tuesday, Adobe Digital Insights said online sales from Thanksgiving through Cyber Monday came in just under $20 billion, a 15.2% jump year over year, with mobile representing 33.1% of that online spend. Cyber Monday set a record for the largest online shopping day in history, according to Adobe, with $6.59 billion in sales (in the U.S. that is, because Alibaba raked in $25.3 billion in China on 11.11, or Singles Day, alone). Black Friday brought in $5.03 billion and Thanksgiving Day, $2.87 billion. 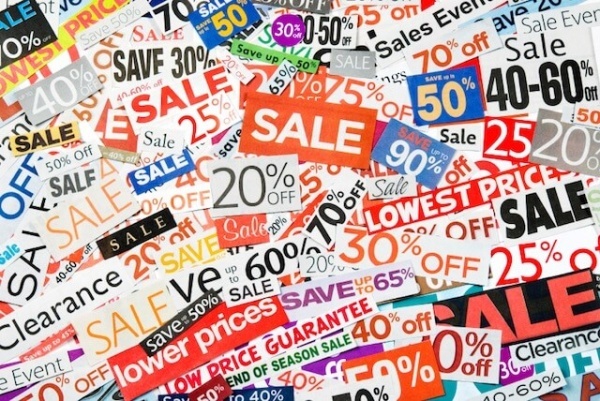 The promotional market has been a haven for consumers, and many have been trained not to buy without a discount—a mentality that also drove their Black Friday moves. In its own data, Salesforce said Black Friday discounts averaged 28 percent off. More than just the percentage off, was the fact that the overwhelming number of purchases made over the weekend were sold with a deal. According to data from DynamicAction, shoppers were rewarded with discounts and deals everywhere they turned. “In fact, 90 percent of online orders were placed using a promotional code on Cyber Monday this year, and an average 88 percent of orders used a promotion over Cyber Weekend (Thanksgiving Day-Cyber Monday),” DynamicAction CMO Sarah Engel said in a briefing Tuesday. Whether surprising or not, NRF said department stores were the top shopping destinations, with 43 percent of consumers heading there, followed by 42 percent who cited the Internet as their top shopping destination. Electronic stores came third with 32 percent of shoppers heading there, and 31 percent of shoppers went to clothing and accessories stores. Clothing, however, topped the charts when it came to most popular gifts purchased, with 58 percent of consumers indicating they designated their dollars there. Diving deeper into the data, location data company Skyhook tapped into its database of 10,107 stores across Walmart, Target, Macy’s, Kohl’s, Best Buy and Sears, and found that the discounters outperformed the department stores. The company said it chose this set of stores since they compete with Amazon. Adding to that, The NPD Group’s Marshal Cohen said citing stats from the market research firm’s partner, CivicScience, that Thanksgiving Day and Black Friday were a “mixed bag” and that traffic was neither stellar nor consistent from store to store. Looking at inventory, DynamicAction said retailers are well positioned to make it through the season without stockouts, and the discounts are expected to continue, too.